For many of us, the ultimate skincare treat is to apply a facial masque and just sit back and relax while you let the mineral rich clays, fragrant flower waters and high performance extracts do all the hard work. 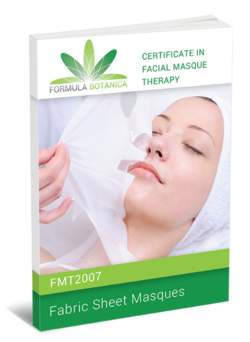 Our Certificate in Facial Masque Therapy teaches you to make therapeutic spa-quality facial masques to pamper your delicate facial skin. 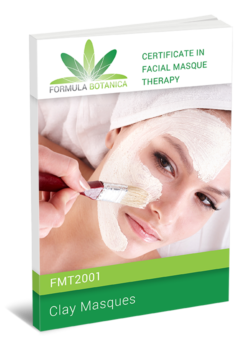 This course will teach you to make the 7 different types of organic facial masque using clays, creams, clay creams, gels, gel-to-milk formulations, superfoods and fabric sheet masques. Influence the health of the skin by using different types of facial masques. 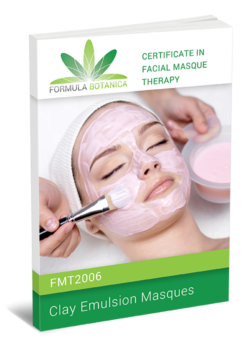 Study the foundation and best ingredients for the seven different types of organic facial masques using clays, creams, clay creams, gels, gel-to-milk formulations, fabric sheet masques, and superfood suspensions. Research the science of clay and learn how it behaves at the molecular level. 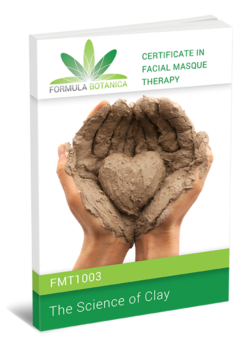 Study the main types of clays and muds available for use in masques. Follow the 6 recommended steps for correctly preserving clay-based masques. 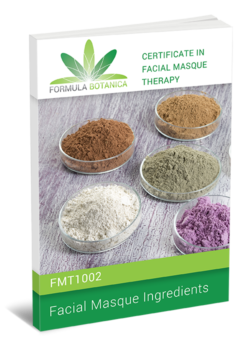 Create 100% natural facial masques based on clays, creams, clay creams, gels, gel-to-milk formulations, fabric sheet masques and superfood suspensions. 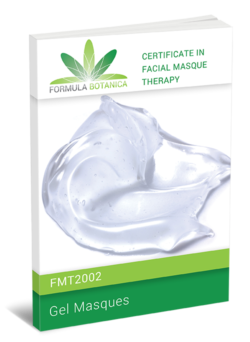 Formulate with innovative and therapeutic organic ingredients to create wonderful skin treatments. 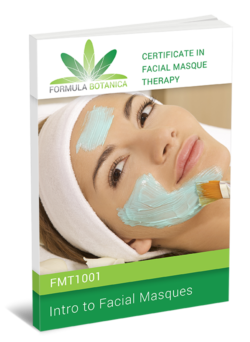 Become a facial masque designer and innovator. Unlock new modules as you work through the course sequentially to enforce learning points. 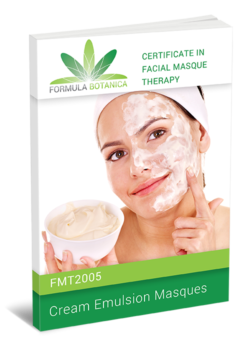 Facial masques are not really ‘skincare’, they are more of a treatment product. A good face mask should made visible and noticeable improvements to the skin immediately. 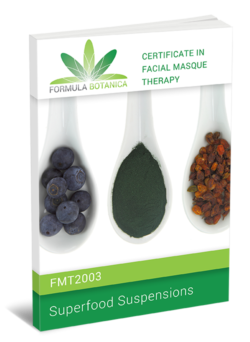 Traditionally, face masks have been made with clays and muds with have a drawing effect on the skin. 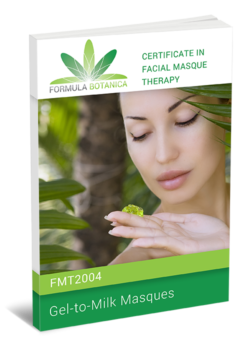 In this module you will learn all about the science of facial masques – how they work, what they do, the different types of organic masque you can make and which ingredients you can use. Now we get to the fun part, actually get our hands dirty! 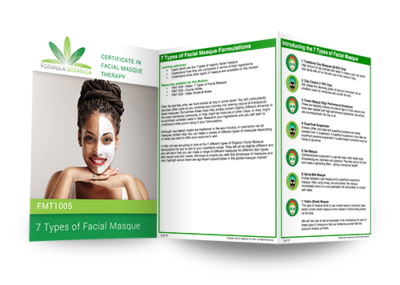 This module is all about guiding you through the process of creating a variety of facial masks – from the very simple ones to more complicated ‘high-performance’ masks. 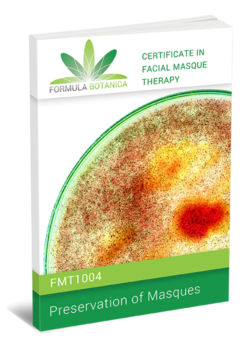 By the end of this module you will have created your own series of different facial masques and you will be an expert therapeutic masque formulator. Receive 5 gel masque formulations, including our Wildflower Gel Masque, Fresh Minty Gel Masque and Citrus Gel Masque. 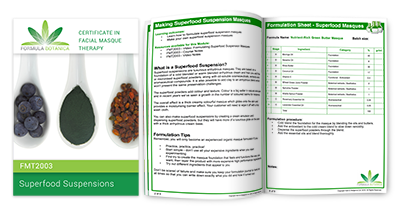 Receive 5 superfood suspension masque formulations, including our Purple Corn & Acai Masque, African Baobab Masque and Siberian Blue Clay Cream Masque. Receive 6 oleogel masque formulations, including our Lavender Purifying Gel Masque and Deep Cleansing Honey Masque. Receive 5 cream masque formulations, including our Apricot 2-in-1 Masque, Fresh Herbal Cream Masque and Edelweiss Masque. Receive 5 clay emulsion masque formulations, including our Yellow Hazelnut Masque, Rose & Pomegranate Masque and Violet Moisturising Masque. When you study with Formula Botanica, you become part of a close-knit international community of students and graduates all around the world. We support you all throughout your studies and beyond, and we give you access to our expert botanical skincare science and business files while you are enrolled on your courses. Once you enrol with us, you are welcomed into our international student community groups which contain many hundreds of our students and graduates from all over the world. Everyone knows each other and many of our students meet up in their respective countries to share information and formulate together. In our groups you will receive expert tutor support and peer support. Ask questions, share photos, troubleshoot formulations. Celebrate your victories and get encouragement when you need it. You are never alone. The support doesn’t finish when you graduate. We want to keep in touch with you once you’ve finished your course and support your career in organic skincare. We offer lots of free promotion for our graduates because we want to help give your business the support it needs when you launch it or as you grow it. Be featured widely on our website, on social media and on our mailing list. 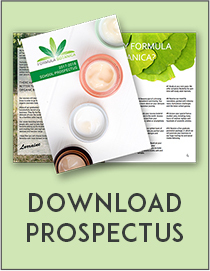 Formula Botanica has many thousands of followers and subscribers all around the world so this will help you create a splash when you launch. 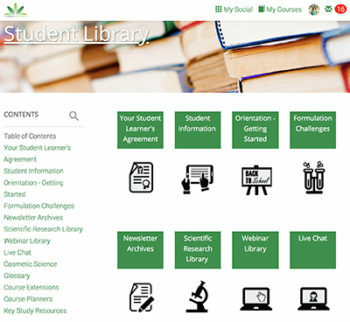 Formula Botanica issues Open Badges to students who pass their courses successfully. These badges can be used on your resume, social media pages and LinkedIn profile to demonstrate that you are a skilled organic cosmetic formulator. 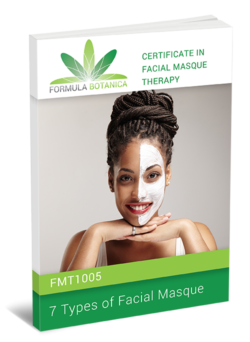 Enrol for our Certificate in Facial Masque Therapy to formulate high performance therapeutic facial masques that will nurture, cleanse and soothe. Basic formulation experience. For people who want to formulate facial masques. Peer support & tutor support via a private Facebook group. Term times. 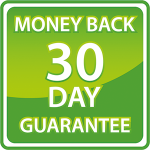 Self-paced training where you have up to 12 months to complete your course. Formula Botanica is accredited by the Open & Distance Learning Quality Council. Projects, activities and reflexive learning. Each main module ends with a short assignment. Our Tutor Team has an educational background in cosmetic chemistry, biology, education and business management. Let us support you. Formula Botanica operates a term time system, so we can get all of our students started at the same time and run online study groups. Enrolment for all of our courses will be open during this period. If you want to be the first to hear when we open enrolment, make sure you pre-register for this course.